Effect: Two people each select a card. The performer then shuffles the deck by giving it a riffle shuffle. The spectators take the deck and returned the cards with the deck in their own hands in such a manner that there can be no suspicion of trickery. The two cards are not forced. The performer now spreads the deck face up on the table so all the faces are in full view. The first card is found by contact mindreading (apparently). The first spectator holds the performer's wrist while he moves his fingers over the face up cards. Suddenly, the performer's finger drops down on a card and it is the first selection. 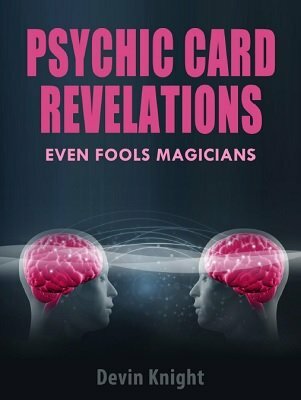 The performer says the second card will be found using non-contact mind reading. He gives the deck to the second spectator to thoroughly shuffle. Once again, the deck is spread face up on the table. This time the performer asks the second spectator to merely think 'that's it' when the performer's forefinger is above the card. The performer passes his finger over the cards and suddenly drops his finger on a card. Believe it or not it is the second selected card. The performer gives the deck to a third spectator to place inside his right coat pocket. The performer turns his back and has the spectator reach into his pocket and remove a card from anywhere in the deck and place it in his left pocket. Remember, the performer's back is turned during this. The performer picks up the cardboard and shows what he has written. It is the name of the card that was hidden in the spectator's pocket. There is positively no double or secret writing. Looks like real psychic power. Baffling beyond words.